Sophia is an evolving genius machine. Her incredible human likeness, expressiveness, and remarkable story as an awakening robot over time makes her a fascinating front-page technology story. Sophia’s creator, Dr. David Hanson, is the founder of Hanson Robotics and a modern-day renaissance man who has built a worldwide reputation for creating robots that look and act amazingly human. After working at Disney as an “Imagineer,” Dr. Hanson aspired to create genius machines that will surpass human intelligence. Dr. Hanson believes that three distinctively human traits must be integrated into the artificial intelligence of these genius machines: Creativity, empathy, and compassion. As an extension of human intelligence, Hanson Robotics’ genius machines can evolve to solve world problems too complex for humans to solve themselves. Sophia personifies this bold and responsible goal. 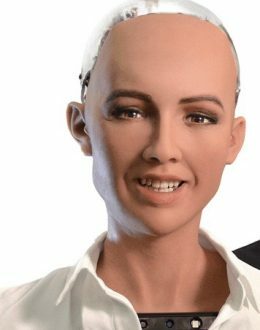 Please follow Sophia’s journey to observe and engage with her as she develops into an exciting platform for artificial general intelligence (AGI) and service robotics applications in business, medical/healthcare, and education.